Hundreds of people flocked to a beach in the Indian city of Mumbai after reports the seawater had turned sweet. Several people who drank the muddy water from the Arabian Sea said it had been changed by a miracle and could now cure illnesses. Authorities in Mumbai said they collected samples for testing but warned against drinking the polluted water because of health risks. Many saw it as a blessing from Makhdoom Ali Mahimi, a 13th Century Sufi saint. "This water is definitely sweet. We see it as a blessing from Baba (Holy Saint)," a man called Rafique told news agency AFP. "I will carry this back for my two sons and my parents," he added. Reuters news agency reported seeing a man bathing a young boy in a creek near the beach, which it said receives thousands of tonnes of raw sewage and industrial waste every day. Others, the agency said, were seen gathering water as rubbish and plastic drifted past. 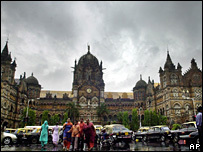 Mumbai officials said the water could have taken on a sweet taste for several reasons, including an inflow of fresh water - or pollution, Reuters reported. Last year, Mumbai residents flocked to a local beach after reports diamonds were washing ashore. Police said it was fragments of glass.